Make Universal Sompo Online Payment in a very easy and safe process. Universal Sompo provides the online facility to pay the premium, Renew and Buy the policy. Here we have provided the pictorial representation of how to pay the premium through online to make your process easy. So the Customers can check the following sections to get the required details. The Universal Sompo General Insurance Company is providing many General Insurances such as Health, Motor, Commercial and so on. Therefore, the people can buy the policy in two ways either offline or online. If you want to buy the policy or to pay the premium amount through Offline, the Policy Holder has to visit the nearest branch office. The Insured has to wait in long queues for Universal Sompo Premium Payment. But it is a time-taking process. So to save the valuable and precious time of customers, the Universal Sompo General Insurance Co. Ltd Company has come up with New Ideas. I.e, Universal Sompo Online Payment. The payment process through online is secure and safest way for the Life Assured. The Buyer can sit at his/her home and can make payment of premium at any time. So, this is the most convenient way for the Policyholder to pay the Online Premium Payment from any corner of the world.Universal Sompo General Insurance Company offers various Online services for its Customers. By using those services, the People can buy the products offered by Universal Sompo Insurance Company without visiting the nearest branch office. You can also renewal the Policy through Online. There is no need to Log on to the Official site of the Company. Therefore, the Policyholder can avail the services provided by the Universal Sompo Insurance company and save your time. Online Premium Payment is one of the best ways to pay the premium of the policy bought. The people who want to buy a new policy or renew the Policy or to pay the premium amount can go through this Online Services. The Policy Holder can go through the following steps for getting the complete idea about Universal Sompo Online Payment. The detailed steps are discussed below in a pictorial representation. First, visit the official site i.e, www.universalsompo.com. At the top of the Home page, you will find “Products” option. Click on that “Products” Option. 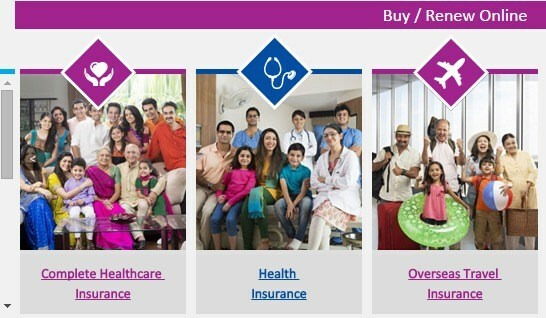 By Clicking that Option, you can see the types of Insurance Policies like Health, Motor etc. Now, select the type of the product which you have taken. For an Instance, If you have taken Health Insurance then Click on “Health”. By clicking that link, you will be directed to the new window as shown below. 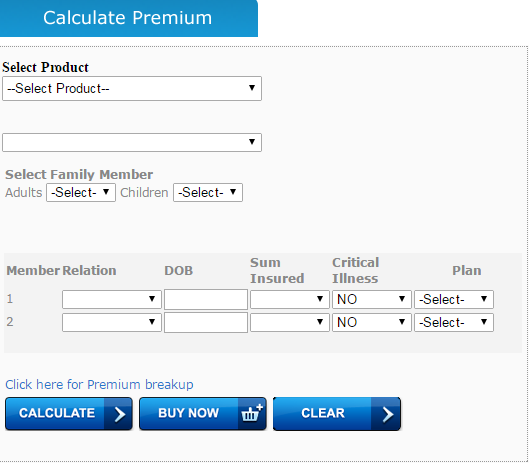 Fill all the fields to calculate your premium. Finally, you will get the Premium Amount. Therefore pay the Premium Amount by clicking the Pay Premium Option. Pay the Universal Sompo Premium amount through Online using Debit Card/ Credit Card. After Paying, take a printout of the receipt for future reference. After completion of payment, you will receive a confirmation mail to your Email Address. Finally, your Universal Sompo Online Policy will be issued. There are various types of policies provided by Universal Sompo. For every policy, the method of premium may change. As we know, the corporation offers various products like Motor Insurance, Health Insurance, Travel Insurance, etc. So the premium payment may vary according to the policy that you have taken. For Example, if you have taken travel Insurance, You can Pay the Premium Online through the following steps. Visit the official site www.universalsompo.com. 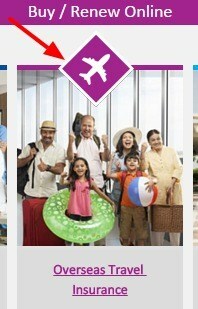 Click on “Overseas Travel Insurance” option. Now you can get the page as shown below. Select the type trip options like Annual Trip, Travel Worldwide, Student Travel, Travel Asia etc. For Example, if you select on Annual Trip. Then you will find “Quick Quote” option in that page. Fill the mandatory details like Policy Start Date, End Date, DOB, Plan, and Premium, etc. If you fill the complete details, then it will generate a quote. After that, you should enter the personal details, and Travel Details. Click on Pay premium button. Pay the premium using Debit card or Credit Card. You will get the confirmation details about premium payment. You will also get the confirmation mail to your mail ID. In this way, you can pay your premium through online. You can also buy a new policy or renewal through online.